Having played festivals all over the world since releasing their first album Origins in 2006, The Horrors should be ready to rock this year's two weekends at Coachella. Their tour with Florence + The Machine this spring should spark a few new fans as well. Sounding like Depeche Mode and looking like The Cure, the boys in this English band were not even out of the womb when those bands were formed! 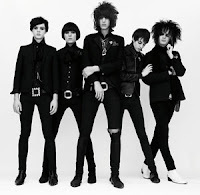 Not to be confused with any small-town USA metal bands, The Horrors have been on music critics' radar for several years. Pitchfork named "Sheena Is A Parasite" (the band's debut single) one of the Top 25 Videos for 2006!